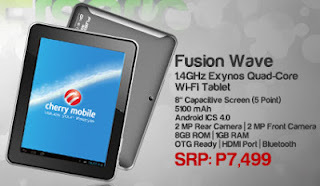 Cherry Mobile unveils its new tablet Cherry Mobile Fusion Wave, this tablet has been announced lately in Cherry Mobile Facebook Fanpage. It is also been announced that it will have the same processor as Samsung Galaxy S3 called Samsung's Exynos processor. With this kind of processor integrated in Cherry Mobile Fusion Wave we can expect more power and eventually play HD games and HD movies just like what Samsung Galaxy S3 can do. Price of Cherry Mobile Fusion Wave is Php7,499 SRP. Available in The Philippines Nationwide this June 2013. Estimated benchmark of Cherry Mobile Fusion Wave is about 14k+ or almost 15,000 considering its hardware and chipset. More reviews to come after the launch of this device. This is another yet surprise by Cherry Mobile, as they constantly bringing new powerful smartphones, although they are just re-branded phone. At the very least they are bringing Filipinos an affordable mobile phones that can compete to international standard just like Cherry Mobile Fusion Wave. What can you say about Cherry Mobile Fusion Wave? Kindly share your thought with us. Thanks! Salamat sa info sir, updated na po. and diba 2mp din ang front cam?